This seat covers fit most of the standard vehicles. 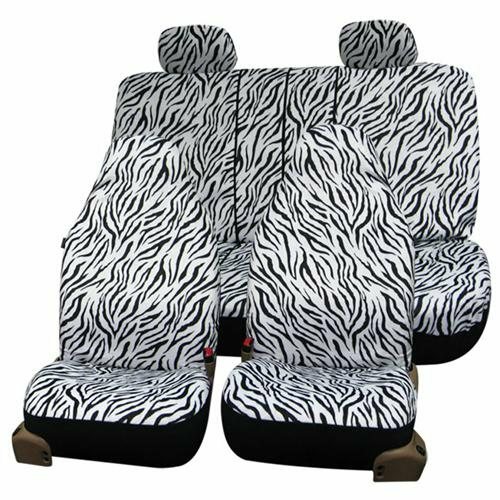 Made of high-quality and durable Zebra animal print velour with 3mm foam in the middle and a layer of mesh cloth as the finishing layer. It is the same kind of high quality material used to make clothes and shoes. The material is very soft and comfy, and 100% washable and breathable. Front side airbag compatible – special stitching technique that allows them to inflate upon impact. Back of the front seat is made by durable stretchy fabric with opening pocket for storage. Rear bench covers have three zippers to accommodate left and right 40/60 split, 40/20/40 split and 50/50 split. It also allows you to fold down the cup holder or armrest by unzipping one of the zippers on the backrest cover. For non-split bench seat, you can also unzip and take off middle piece to make the cover shorter if needed These covers come with adjustable straps for easier installation and securer fit. No professional installation required. You do not need to remove your original seat cover, it slips right over your seat. The covers change the interior’s look and feel of your vehicle instantly. Provide protection against stain, fading and dirt, or cover up torn seat. Works well on heated power seats.